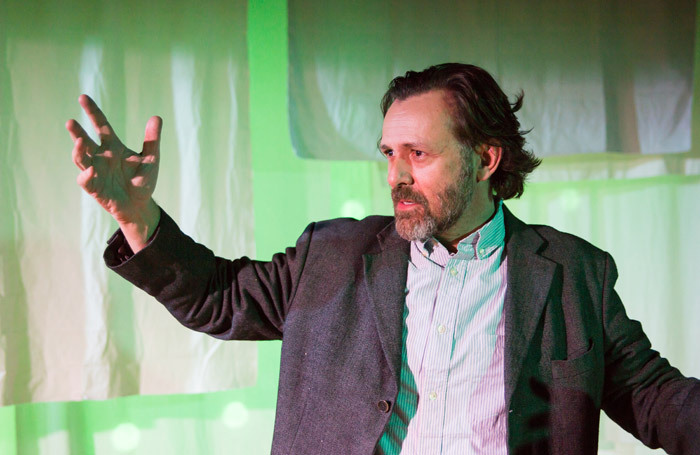 A dishevelled, basement-dwelling misanthrope spouts bile in his video diary in The Ungrateful Biped, writer and performer Philip Goodhew’s update of Dostoyevsky’s Notes from Underground, which marks Rupert Graves’ debut as a director. At once self-absorbed and self-loathing, the unnamed antihero broadcasts rants about his illnesses, paranoia and lack of status in society to the cybersphere. In Goodhew’s snarling protrayal, he paces about, alternately haranguing all comers and wallowing in misery, then embarks on a narrative that begins with an ill-advised reunion with old schoolfriends and partly explains his jaded world view. As an adaptation, the play sticks to the novella’s original structure, but nods to the present with numerous references to Facebook and TV celebrities. Abrasive jokes provoke the odd nervous laugh, yet their borrowed wit often strikes a sour note. And while the extent of his alienation might normally provoke sympathy, this antagonist’s unremitting awfulness seems to place him beyond pity. Designer Natalie Furnell-Calvert’s suitably slovenly set is strewn with detritus, with hung-up sheets as a backdrop. The location of a desk with laptop plugged into a TV set on the floor proves the most problematic element of the staging: in this small playing area, the action is sometimes obscured. In contrast to the vituperative, up-down nature of the performance, artful lighting from Pablo Fernandez Baz subtly evokes changes of setting. Graves’ choice of such a visceral piece results in a convincingly in-yer-face – even bracing – show. But the character’s lack of redeeming qualities makes for an uncomfortable 75 minutes.